Late last year reports came out that Haneda Airport is set to undergo renovation work in preparation for a surge in flights expected around the 2020 Tokyo Olympics (apparently to include a golf driving range in a new-look Terminal 1). It will be the latest in long line of plans and facelifts for an air hub that has rarely had time to establish its identity. Opened in 1931, usurped as Japan’s prime handler of international flights in 1978 by way-too-distant neighbour Narita, given a massive and much hyped facelift in 2010 (which included a bunch of international flights and a terminal to handle them), expansion of the international terminal in 2014, made host to Japan’s first ‘transit zone’ hotel the same year, Haneda has had to prove itself a flexible transport resource over the years. Indeed it must; according to website World Airport Codes, Haneda (aka Tokyo International Airport) was the fifth busiest in the world for passenger numbers (2015). Most long-haulers, like me, will likely have made their departures from Japan at Narita. 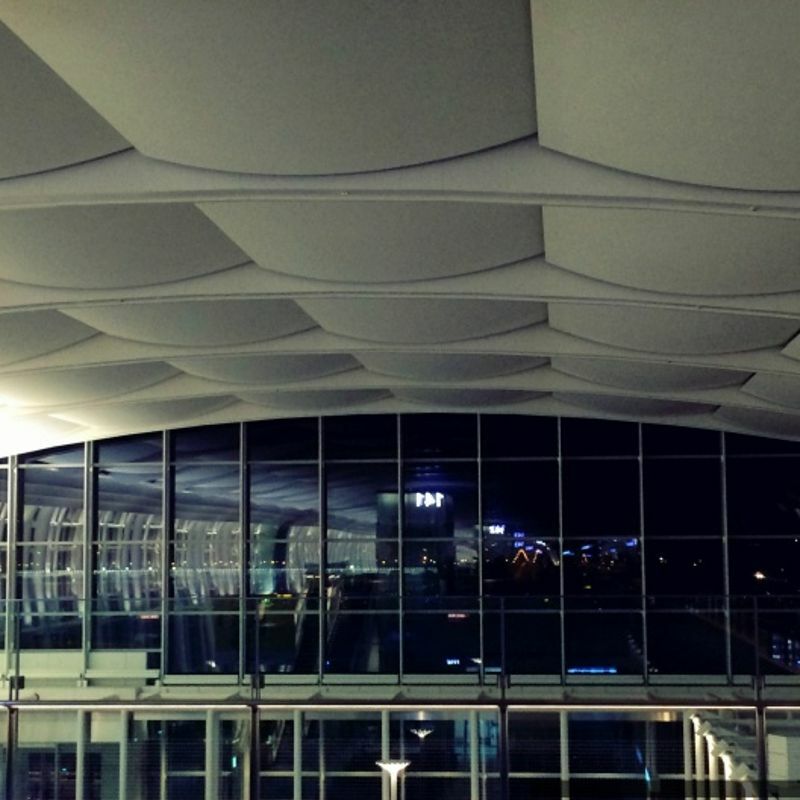 So I was a Haneda first-timer when flights home for Christmas took me via Hong Kong. 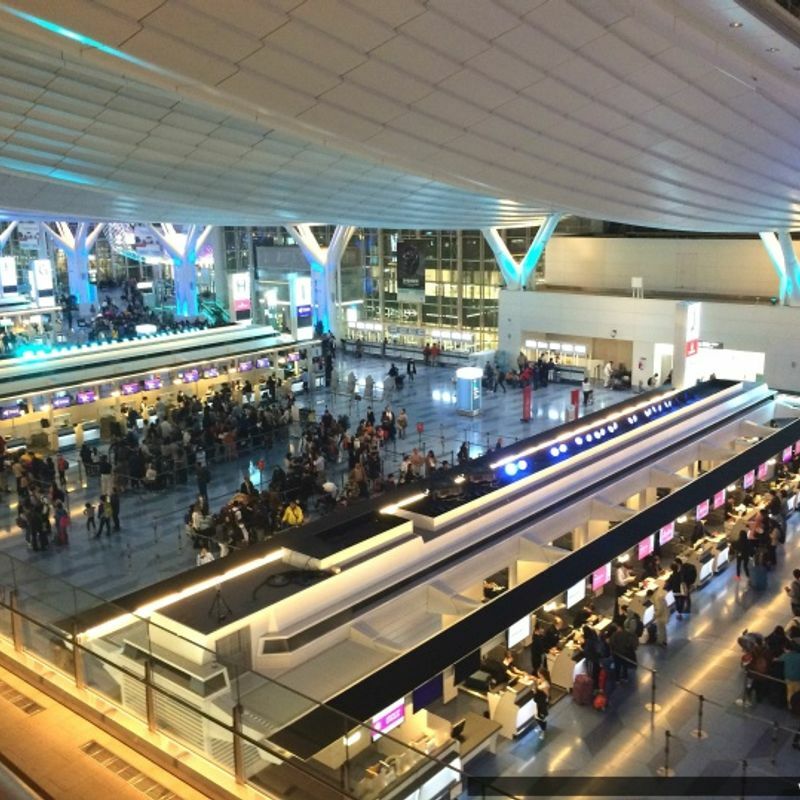 This then is a first timer’s guide to the Haneda Airport international flight experience, with the odd (and inevitable) comparison to Narita thrown in. The first thing to say here is that, from central Tokyo, it’s much easier than getting to Narita, by some distance. The Tokyo hub for access to Haneda Airport is the Hamamatsucho Station / Daimon Station area and Shinagawa Station. This traveller was catching a 1:00 am flight so had plenty of time to kill after work (I wasn’t going home first). As far as Tokyo goes, there’s not a great deal of entertainment or eating options near Hamamatsucho / Daimon Station. Both are within spitting distance of each other. I had dinner at a Denny’s across the street. … I took the Monorail. Access to the Monorail is via the early floors of the World Trade Center Tokyo (which have the vibe of a neglected shopping center from the 80s). There’s some confusion here when you check train schedules on websites that’ll do that for you; the stop/station names are somewhat confusing when crossed referenced with airline itineraries; Haneda Airport International Terminal, Haneda Airport International Terminal Building, Haneda Airport Domestic Terminal, Haneda Airport Terminal 1, Haneda Airport Terminal 2. In my case the flight is ‘international’ (I know this because it’s going to Hong Kong), but the flight itinerary just says Terminal 1. And what’s the difference between Haneda Airport International Terminal and Haneda Airport International Terminal Building that one undisclosed schedule planner is telling me about? In the end a traveller just has to let go a little. I got on the next train to depart and got off at Haneda Airport International Terminal Station around 15 mins later (after enjoying an elevated view of some expensive, if a little lonely, Tokyo Bay real estate). Monorail and Keikyu Lines plug you right into the airport action. The check in counters are on 3F. Counters A - L are laid out right to left as you arrive in, err, departures from the train stations (you’ll be spilled out somewhere between E and F). At around 10:00 pm Haneda was all hustle and bustle but not annoyingly so (although holidays did start the next day). Still, around the counters it was difficult to get a seat and do a pre-check-in luggage inspection. I’m one of those people that likes to arrive for a flight early and who frets about not having checked in online (because I don’t trust the machines)!! In the queue for check-in, I could tell I wasn't the only one, and even those who appeared to have checked-in online did’t seem to be clear on what that meant, and stood in the same queue as those of us who hadn't. Arriving early at Haneda is no bad thing. 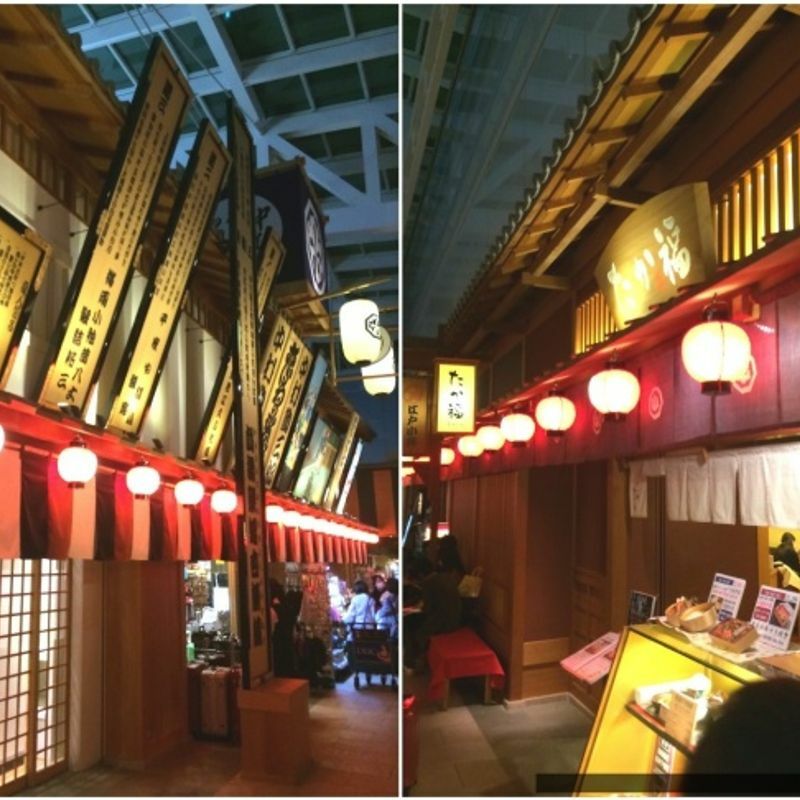 It gives you time to have a look at Haneda Nihombashi and EDO MARKET PLACE. The former you can’t miss as it looms (all 25 m of it) above the departure hall. 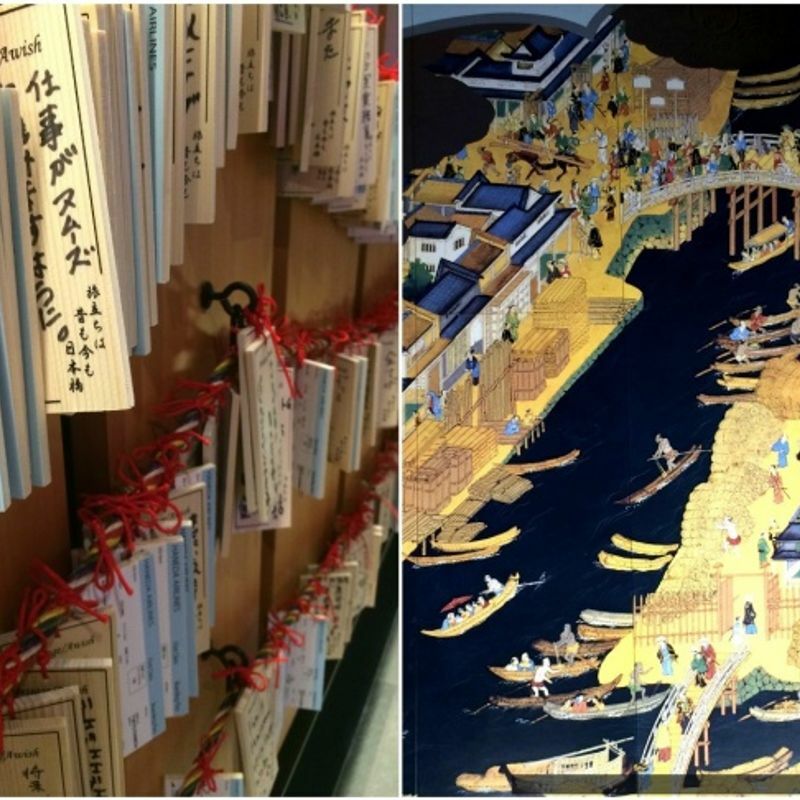 From here you can cop an ogle of the hive of activity below and check out some beautiful Edo era folding screens that have come from the National Museum of Japanese History. Next to that bit in Malaysia's Kuala Lumpur Airport where you could actually go outside and sample the jungle (Is it still there? ), this is one of the most interesting attempts to inject a bit of character into an airport that I’ve seen. There are pamphlets floating around that can tell you more about the construction of the bridge. Once you’ve crossed (you’re on 4F now) you enter the EDO MARKET PLACE zone. Yes, it’s all fake and a little bit shiny but it’s not something you’re likely to find in any other airport. The Edo era streets house a pretty interesting collection of shops, restaurants, and other forms of eatery. There’s plenty of seating up here, too, the kind that you might expect to find outside of matcha shop in Kyoto. Be warned though, the quaint aesthetics aren’t enough to deter knackered travelers from ditching shoes and dignity to sprawl out and kip. Offering a bizarre contrast to all of this is TOKYO POP TOWN (5F). HOT ZONE and COOL ZONE may sound a bit weird but there are some fun ‘character’ stores to have a look at as well as a Don Quijote store (SORADONKI), should you find yourself short of a some novelty phone cases (or if you’re unable to wait to eat some snacks that you’ll likely get much cheaper at the other end of that flight you’re about to catch). 5F also gives travelers access to the rather snazzy Observation Deck (although the view is nothing to write home about). Overall, pre-immigration Haneda gets the thumbs up and is pleasant reward for those that like to check-in early. No first-timer guide of this kind could be complete without addressing the bit of panic, pre-immigration, that once a traveler crosses that line they'll lose access to a number of services. This is largely not the case at Haneda. On the other side a traveler will find the requisite money changers and other banking facilities, food/drink, insurance providers, and smoking areas. At this kind of time there were long queues to get through the immigration/security gates (3F), but once moving things flowed nicely. Immigration was the usually surely experience that Japan offers (Is it too much to ask for a smile? ), but wasn't going to let that spoil the holiday. Ditch your drinks at security. Cigarette lighters seemed to be OK.
Have passport and boarding pass ready for security. Didn’t see any requests to take off shoes, but it’s always a good idea to take off belts in advance and have laptops out for inspection. Have your ‘Gaijin Card’ ready at immigration along with the ‘Embarkation’ part of the immigration form filled in (the other bit gets stapled into your passport - I wish they wouldn’t do this). 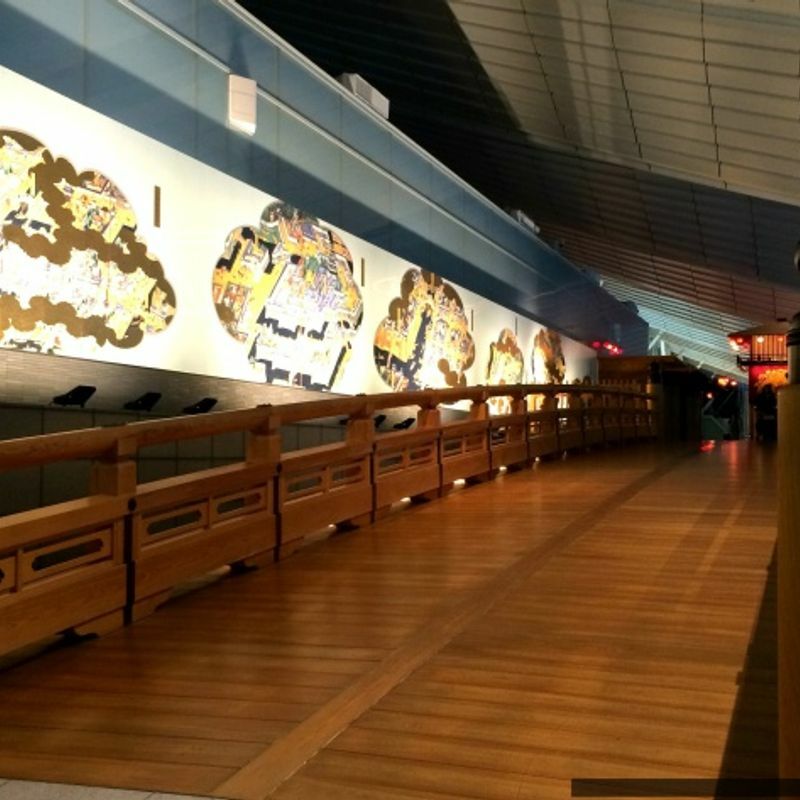 Things lose a bit of character in the post-immigration departure area at Haneda (there’s no Edo era replicas or novelty ‘zones’), but those that get a kick out of these international buffer zones won’t be disappointed. There's the usual collection of brand stores (Really, who’s doing this kind of shopping here? ), food court, banking and money changing facilities (many open 24 hrs), cafes, smoking rooms, and plenty of bathrooms. It still looks new (as one supposes it should) and nothing seemed to be broken. There are one or two cool lounge areas with interesting collections of seats to spread out on before you’re beckoned to the usual cattle pen environs of the departure gate. Staying charged and connected: No trouble here. Haneda has plug sockets just about everywhere. In some cases, departure lounges look something akin to one of the Dystopian scenes in The Matrix in which we realise that Keanu Reeves and his mates are actually plugged into some kind of pod. There’s no reason not to be fully charged here (unless you’ve forgotten your lightning cables). The free Wi-Fi worked fine for me. Another vital resource in the departure area is the presence of drink vending machines. 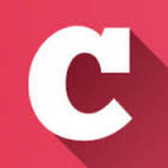 Usually in these places, the thirsty traveler in transit needs to dig through change and calculate exchange rates before spending exorbitant amounts of money on a bottle of water from a cafe. Not so in Haneda (although you'll pay a little more for your drinks from these vending machines). That said, at one point there was a queue for the vending machine I spotted and when I returned after it had depleted, the bottles of water had sold out. If you've get any advice for the first timer using Haneda Airport, we want to hear from you. Leave us your comments, tips, and guide to Haneda suggestions below.